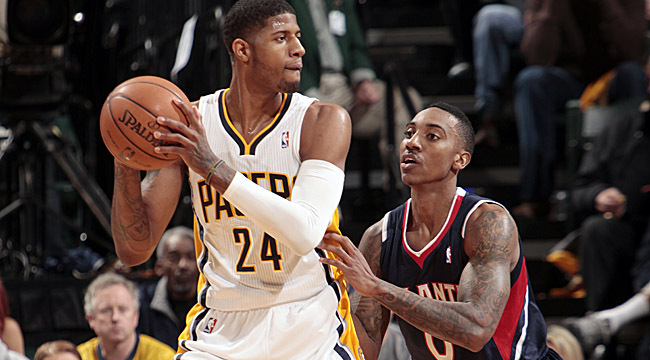 The Indiana Pacers and Atlanta Hawks both skidded into the playoffs with uninspiring performances in April. It was only a few weeks ago when the Pacers looked solidly positioned to secure the Eastern Conference’s second seed. Instead, they went 2-5 in April and fell to third. Meanwhile, the Hawks also struggled at the end of the season and appeared to strategically tank their final two games in an attempt to avoid the Heat in the early rounds of the playoffs. Moreover, this series figures to be have low scoring totals as Atlanta’s good offense will have to shoot extremely well in order to succeed against Indiana’s stingy and physical defense. While these ingredients will make basketball purists drool, most others will opt to look elsewhere for their early postseason fix. Regardless, it is unfair to assume that this series will be bland. In fact, it could very well end up being the most competitive matchup in the Eastern Conference’s first round. Here are five factors to look out for that will determine which team will advance to the conference semifinals. 1. The Hibbert Factor: When the Portland Trail Blazers extended a maximum contract offer sheet to Roy Hibbert last summer, the Pacers were reluctant to overpay to keep their breakout center in Indiana. For much of this season, that reluctance seemed vindicated. Hibbert was not playing nearly well enough to justify a max contract. It appeared as though Hibbert had reached a plateau as a merely good center getting paid as handsomely as a great center should. Since the All-Star break, however, Hibbert has returned to his 2011-12 All Star form. Consider this: In 53 games leading up to the break, Hibbert averaged only 10 points per game and shot just 41.4 percent from the field. While Hibbert maintained his strong defensive instincts, it was a legitimate cause for concern for the Pacers that his offense was nonexistent. Now those concerns seem like ancient history. In 26 games since the break, Hibbert has averaged 15.7 points while shooting 50.8 percent from the field. If Indiana hopes to win, it undoubtedly will need Hibbert to maintain his recent level. Atlanta center Al Horford has been playing the best basketball of his career for the past two months (averaging 19.7 points and 11.1 rebounds) and is capable of taking over the series unless Hibbert comes prepared. Head to head, the 7-2 Hibbert has a four-inch height advantage over Horford. Regardless, in the four games in which they have matched up, the centers have mostly neutralized each other. Against the Hawks, Hibbert has struggled to use his size to his advantage, averaging just 9.5 points and 7.3 rebounds. Meanwhile, against the Pacers, Horford has averaged 16 points and 7.8 rebounds – strong numbers but both below his season averages. 2. The Old Friend Factor: Jeff Teague and George Hill have been battling each other on the court since they were children. They are both Indianapolis natives and continue to work out and train together every offseason. This has been the first full season in which both have been instrumental in directing the offenses of their respective teams into the playoffs. Teague is enjoying career highs with 14.6 points and 7.2 assists. Hill is also averaging career highs with 14.2 points and 4.7 assists. Both shoot respectably from deep, hovering around 36 percent. Teague is only 24 and is playing on an expiring contract. Hill is 26 and received a five-year, $40 million deal from Indiana last summer. Hill showed flashes of brilliance against the Heat last postseason (he scored 20 points in Game 3) but also showed glimpses of carelessness (13 turnovers in the first three games). Whoever does a better job of controlling the tempo and orchestrating his team’s offense will likely go a long way in helping his team reach the second round. 3. The Josh Smith Factor: Simply put, if Josh Smith comes out and performs like he is capable of performing, the Hawks should be able to contain David West and might even be able to create easy baskets in transition by forcing turnovers. However, if Smith comes out and performs like a disenchanted star who knows he’s on his way out of Atlanta after the playoffs, the Hawks will be eliminated early. Personally, I think the Smith-West matchup is the most interesting to watch in the series. Both stars are looking to impress as they will be unrestricted free agents this summer. Smith has the length and timing on defense to give West fits. On the other end, West has enough strength to keep Smith out of the paint and force Smith into hoisting up 18-footers. If Smith starts settling for jumpers, the Hawks will find themselves trailing early and often. 4. The Enforcer Factor: Tyler Hansbrough and Ivan Johnson are two of the toughest players in the NBA. As prototypical bruisers, both bring energy off the bench and are willing to do the dirty work to help their teams win. Because these games figure to be low-scoring affairs, every possession will become that much more important. Both players rank among the league’s best glass eaters. In the advanced statistic called “Rebound Rate”, which estimates the percentage of available rebounds a player grabs when he is on the court, Hansbrough’s 15.2 percent is nearly identical to Blake Griffin’s 15.3 percent and Johnson’s 14.6 percent ranks him ahead of perceived strong rebounders such as Paul Millsap and Serge Ibaka. If either player makes his presence felt on the glass, it will go a long way toward helping his team reach the second round. 5. The Lance Stephenson Factor: One obvious advantage the Pacers will have when matching up with Atlanta will be with their size in the backcourt. The Hawks start two point guards in Teague and Devin Harris. For the most part, Larry Drew has been able to work around this system because many other teams in the league also use small backcourt sets. Indiana, however, is not one of those teams. Because of Drew’s need for Harris’ offense in the lineup, the 6-3, 192-pound Harris will have to defend the 6-5, 228-pound Lance Stephenson. If Stephenson can take advantage of his size and strength and get to the rim, the Hawks will need to compromise their offense by replacing Harris with a bigger defender. Last year, Stephenson was largely a benchwarmer for the Pacers and was only present in the postseason when he was shown taunting LeBron James from the bench. This year, he has stepped up to help replace Danny Granger. In 71 starts, Stephenson averaged 8.8 points, 3.9 rebounds, and 2.9 assists. Stephenson was once a top college recruit and owns New York State’s all-time record for points scored in a high school career. At just 22, Stephenson may be primed for a breakout series at the Hawks’ expense. Has Josh Smith played his last game as a Hawk?